For more projects, click here or on the image below of Gannett Fleming Headquarters Campus. What drone does Gannett Fleming own and operate? What software do we use for post-processing? What does a drone do well? What doesn't a drone do well? What is the level of effort? How long will the drone fly? How large of an area can the drone cover? How are the digital products referenced? What digital formats are available? What rules govern how I can use the drone? This web page is designed as a resource for Gannett Fleming employees and prospective clients who wish to learn more about Unmanned Aerial Systems - Drones - and their derived products available through the Gannett Fleming drone services. Our first drone was purchased in July 2016 to develop an understanding of the emerging Unmanned Aircraft Systems technology and prepare our staff with training prior to FAA policy changes at the end of August 2016. We currently have multiple employees certified through the FAA and cleared by the TSA to fly commercially and are now pursuing use of the technology directly on Gannett Fleming projects. Utilizing specialized post-processing software and custom in-house software, Gannett Fleming has developed a variety of 2D and 3D digital mapping products utilizing traditional photogrammetric methods and has achieved vertical accuracies within inches in open hard-surface areas. With more than one million drones sold last year alone and regulations loosening, commercial operation will become commonplace within the next year. The keys to successful implementation of this emerging technology at Gannett Fleming are the products created, the efficiency with which they can be produced, and the value they provide to our clients. improved safety and addressing some access constraints. Additionally, endless possibilities exist for marketing and business development content. Useful resources found on this site include an overview of the technology, answers to some frequently asked questions (FAQs) and a link to our recent projects page. "UAVs offer disruptive opportunities for companies in the engineering and construction industries. They can dramatically extend human operations by enabling remote sensoring...offerring key benefits such as cost reduction, risk mitigation and quality improvements, thereby bringing a competitive advantage to their adopters. "The drone is the tool of our future." "Unmanned aerial vehicles will change the way engineers work." "UAVs allowed us to do our job safer, more efficiently and significantly faster, saving our client time and money." The interactive map above shows high-res imagery on the left collected in August at a Dam northeast of Harrisburg. The post-processing took only a few hours most of which was computer processing time. By clicking on the slider in the middle, you can easily compare the level-of-detail shown by the drone on the left (2-inch ground resolution) versus the USGS aerial imagery on the right (1-meter ground resolution). Notice the spillway slabs that have been replaced since the July 2015 imagery was flown on the right. You can also zoom in and out to see the detail of the drone imagery. 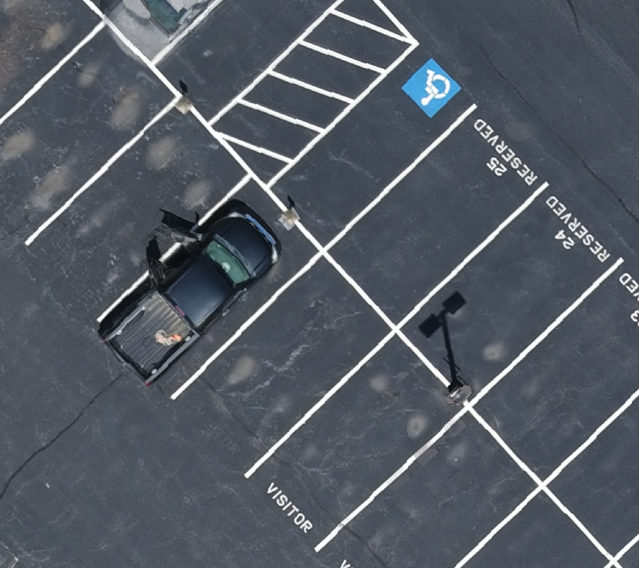 This 1-inch high-resolution image of the north building parking lot clearly shows the pavement markings and the ratchet tie-downs in the back of the truck. 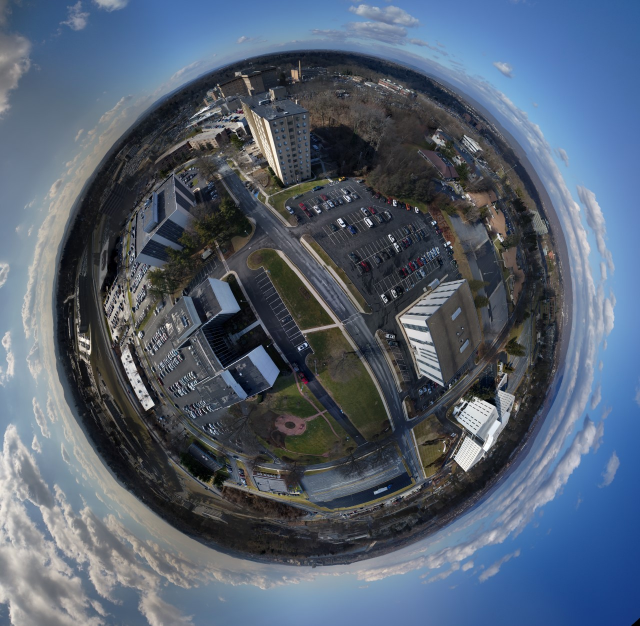 The interactive 3D model above of the Gannett Fleming North building was collected in July 2016. This data was collected in about 10 minutes and processing took only a few hours most of which was computer processing time. You can zoom in and out, spin around and flip upside down this model using any combination of buttons and scroll wheel clicks on your mouse. If you get lost, just hit the home button to return to the original view. Gannett Fleming owns and operates multiple DJI Quadcopters. What software does Gannett Fleming use for processing the data? Gannett Fleming utilizes the Esri Drone2Map software for post-processing the drone collected photography and to generate orthophotographs and digital surface models in the Amazon Cloud. This software is tightly integrated with their cloud GIS platform called ArcGIS Online, which allows us to share these interactive and dynamic 3D products with anyone using a web browser. We have also deveveloped several custom software tools to support video animations and panoramic views. What types of Products are Created? The above point cloud renders over 23 million XYZ points in natural color over a 41-acre project site. These drone-derived 3D point clouds can be further processed to create detailed bare-earth terrain models or used for vertical measurements in a 3D environment. 1 - Provides a safe environment for Gannett Fleming field work. 4 - Replace the subtleties of what an experienced survey can learn from walking a site. A discussion on the accuracy of drone mapping could go on for pages. Simply stated though, the accuracy of a drone's products are a function of many variables including the camera, lens, mounting hardware, telemetry, altitude, image resolution, number of photos, overlap, atmospheric impacts, GNSS Satellite constellation, proximity to buildings, GPS Receiver, Differential GPS and Control points - just to name a few. However everyone still wants to know how accurate their products are. When discussing accuracy there are both relative and absolute accuracy considerations. The source of the aforementioned information does a good job of describing both. But if we had to be quoted, we'd say that the accuracy of a product with high accuracy ground control is on the order of inches in the horizontal and vertical. For the drone survey of the GF North Building, 8 checkpoints in open areas revealed differences anywhere from 0.05 ft to 0.19 ft. The precision of your products also takes into consideration all of the items discussed in the accuracy question above. When thinking of precision (in many cases the detail of the products you get) it's easier to think in terms of a photograph or surface model where each pixel is representative of a certain size on the ground. The term ground sampling distance (GSD) is commonly used. In most cases we are achieving a GSD of anywhere from 1 to 5 centimeters depending upon the altitude of the flight. The level of effort required for any given job is directly related to the size of the area to be collected. But consider you'll need the certified drone operator traveling to and from the site as well as onsite for the collection and then some time to post-process the products. This is currently one of the biggest limitations to drone technology today. Our drone has a flight time of almost a half hour, however to be safe we typically fly for 25 minutes or so on a single battery. Gannett Fleming has several batteries available for every project. The answer to this question is also dependent upon a number of items - Altitude, degree of overlap and the type of products you are trying to create, but a site that is anywhere within 200 acres is achievable. The products can be referenced to any horizontal or vertical coordinate system, but we typically set ground control tied to a state plane system with units in feet. We can provide imagery in a variety of formats such as tif, sid, png, and more, plus vector data in either a CAD or GIS format. 3D model formats include the I3S format and more using common ETL software. How are other engineering firms leveraging the technology? The FAA offers a number of resources for Unmanned Aircraft Systems. The process to become a pilot is pretty simple and requires passing an exam and then being cleared by the TSA. Refer to this site for more information on the certification process, or this site. Here is a free video to teach you what you need to know to pass the test. Find a testing center here. Use the Contact Form for more information on how you can use a drone on your project, or provide comments below on how we can improve this web site to answer your questions.